Salalah Rotana Resort, the Sultanate of Oman’s largest free-standing, five-star hotel, has launched a new bleisure package, mixing business with leisure. 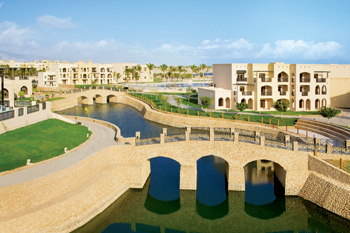 Set along the shores of the Indian Ocean, occupying 125,000 square metres of space, the resort boosts ample indoor and outdoor conference and meeting space with four meeting rooms including the Al Majlis, which features a contemporary arabesque design concept and the Grand Al Hajar ballroom with a capacity of 400, equipped with the latest audio-visual equipment. Salalah, located in the Dhofar region of Oman is only a couple of hours away from major cosmopolitan cities in the Gulf Cooperative Council (GCC). Benefiting from a number of airlines frequently flying to the new Salalah Airport, the resort and destination is easily accessible. The city offers visitors historical sites and major attractions including the famous Wadi Darbat, Al Mughsail and more with tours organised by the resort on request. The resort’s new meetings, incentives, conferences and exhibitions offer includes daily delegate packages starting from RO 79 ($205) per room per night inclusive of breakfast, lunch, two coffee breaks, complimentary wi-fi and more (terms and conditions apply). In addition to this, delegates can avail special air fares from select airlines flying from any destination.